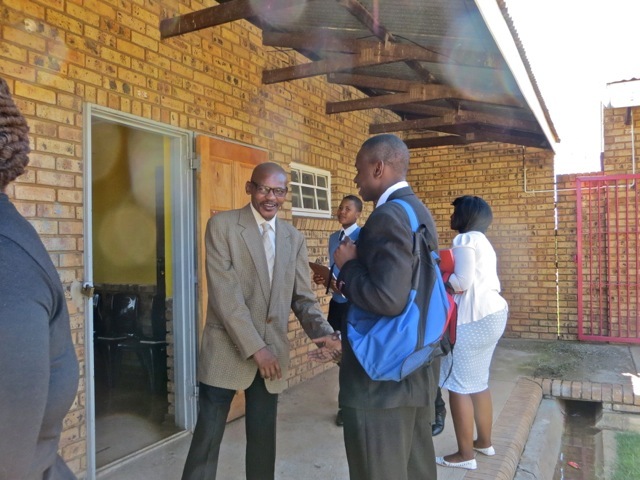 We look forward to Fridays because we get to attend the Ikageng District Meeting which of course is held in Klerksdorp because four elders and E/S Dummer live there and we have a nice chapel to meet in. Elder Oldroyd is the district leader and has proven to be an efficient and caring one. He is not leading the music he just uses his hands from time to time. 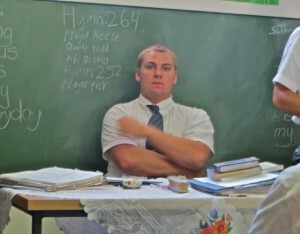 Elder Di Ruscio did lead the music for the day but here he is giving a spiritual thought. 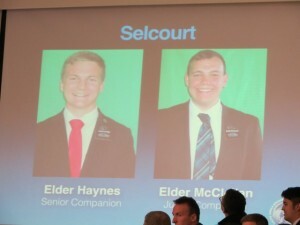 The first order of business is to go through the area books with each area reporting a little about the work is going in their areas. This includes investigators with baptism dates, less actives they are working with, etc. 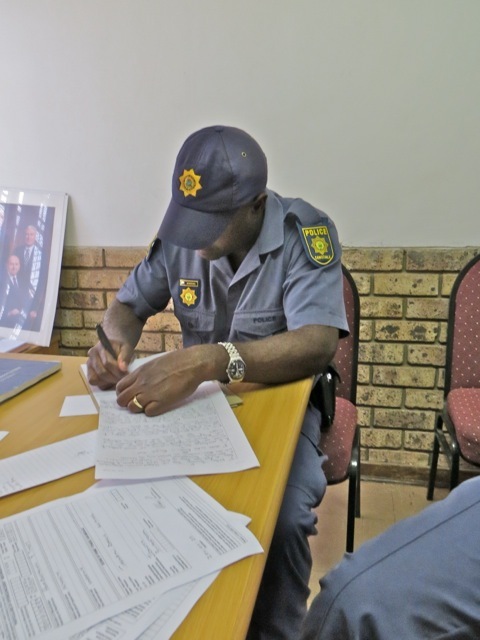 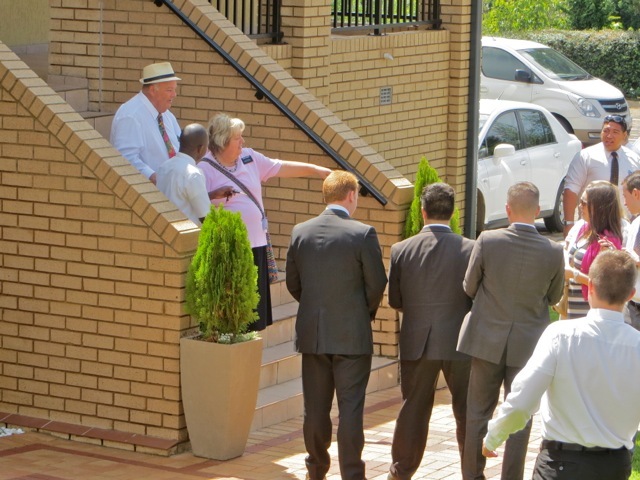 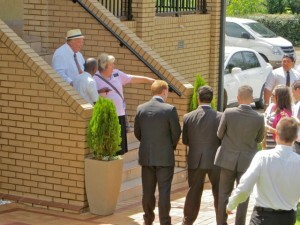 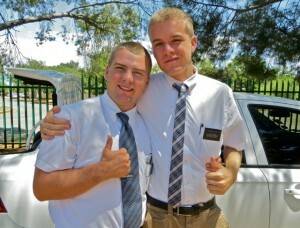 Elders Liera and Alvial reported on the Potchefstroom area, elders Oldroyd and Todd reported on the Jouberton area. 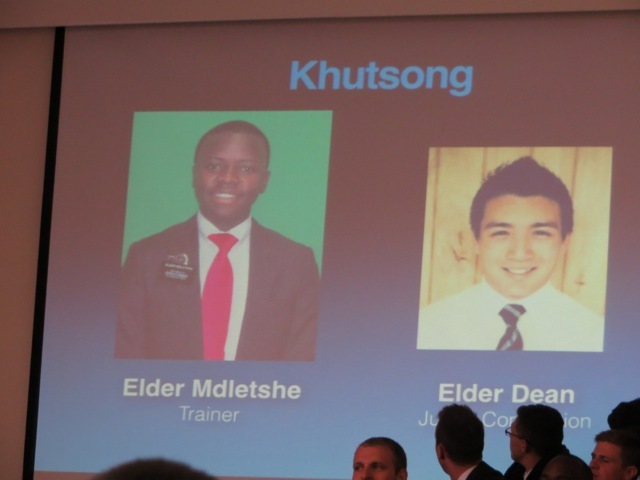 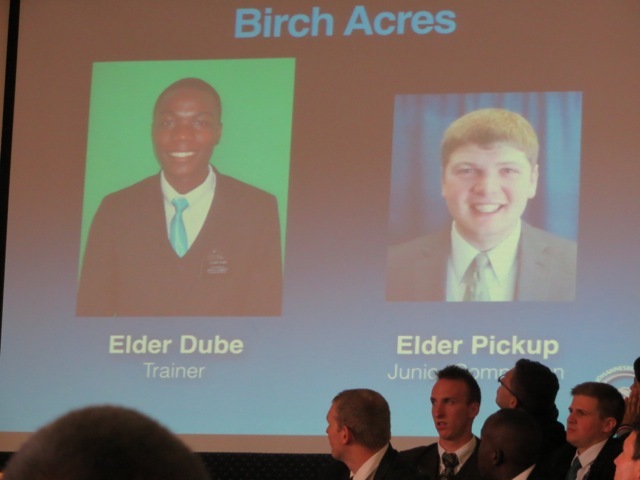 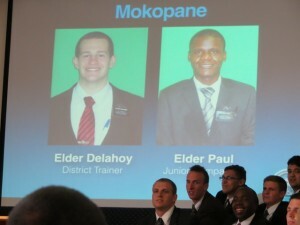 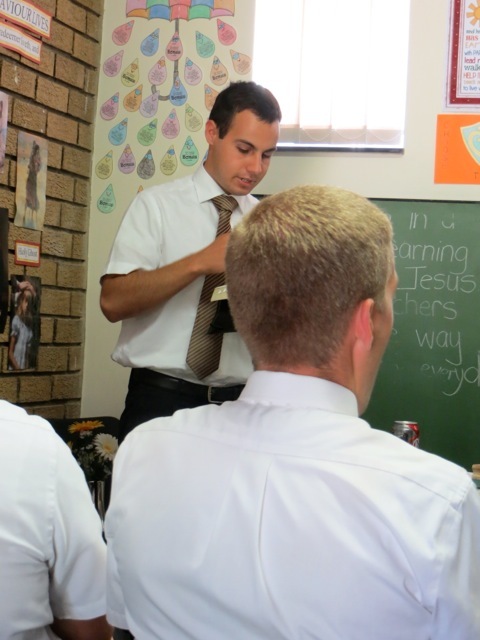 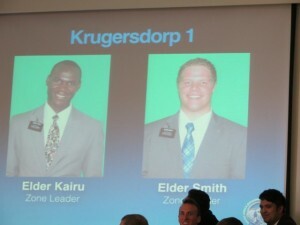 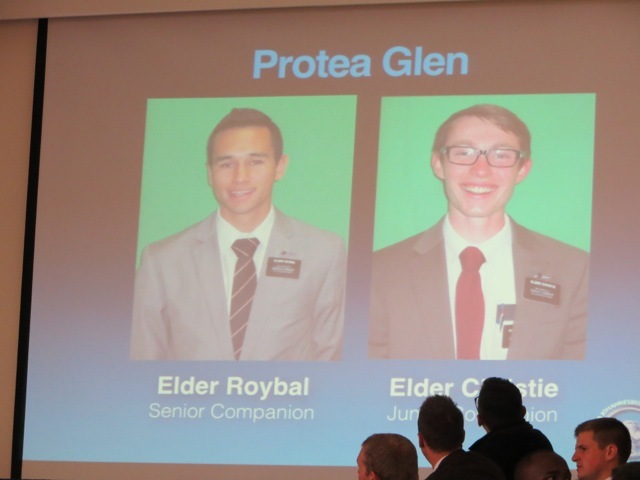 Elder McAllister and Di Ruscio serve in the Klerksdorp area. 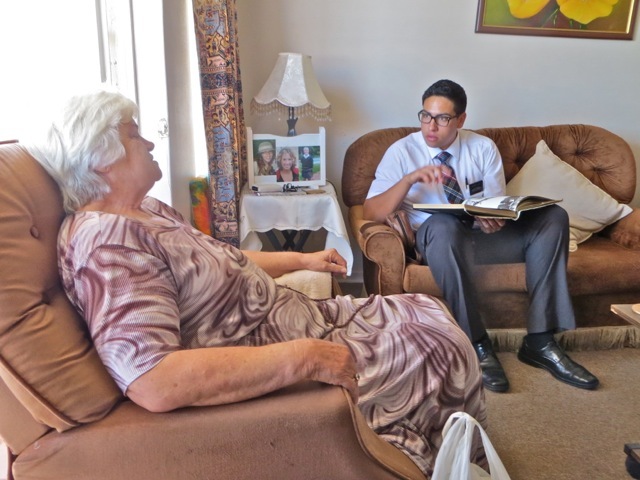 While they are giving their report elder Oldroyd looks through their area book to see if it reflects what they are describing. 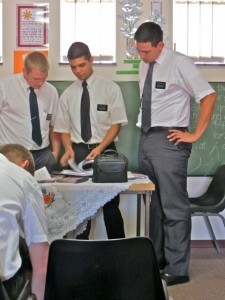 After the meeting we provided donuts to keep them going until lunch – which is where they went as soon as they finished the donuts. It is a good district and there are lots of potential for baptism in March and April. 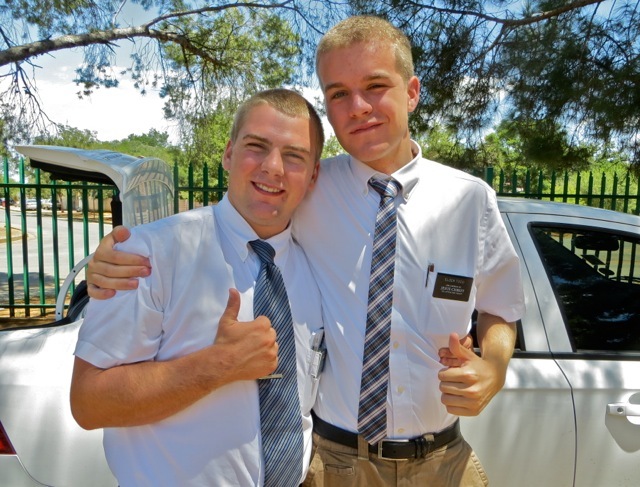 This entry was posted in Johannesburg Mission - Back To Africa on February 27, 2015 by Bill. We took the elders up to Parys and spent a couple of lovely and interesting hours with sister Bobbi and of course Louis. It was elder Alvial’s first time and elder Liera’s 4th or 5th. 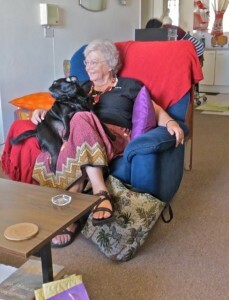 As usual Louis got lots of attention and responded with a madly wagging tail, lots of kisses and in general just being Louis. We were able to bring back her CPU so she can resume playing her computer games – Louis is very happy that her attention will be directed elsewhere for at least part of the day. Later in the day while I was out running errands Mary had piano lessons with Lorato Kujane. 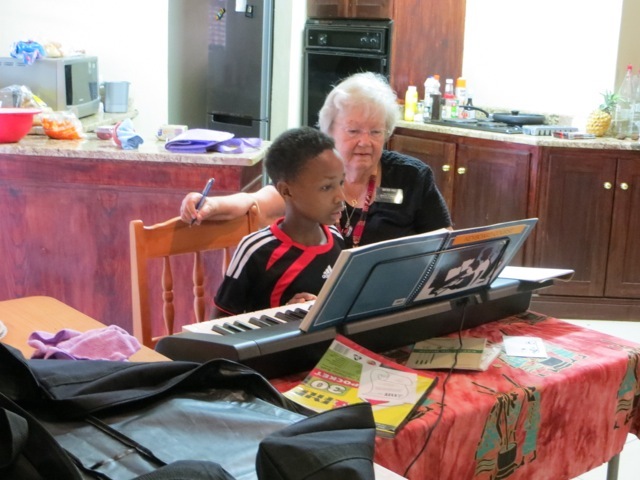 It looks like she has a real student with Lorato who walks about 1/4 of a mile lugging a good size keyboard to have her lesson. 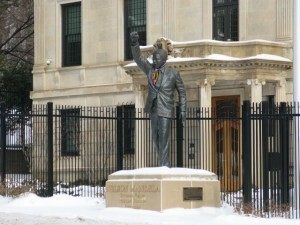 Arlo and Sandy Mickelsen – our friends who are serving in the Brisbane mission – sent us a picture of the Mandela statue in front the the Washington DC South Africa Embassy. 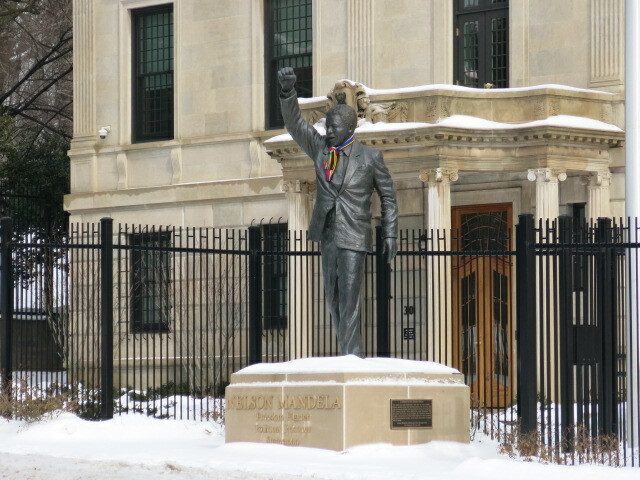 Notice that during the winter they put a scarf around his neck to keep him warm – there is seldom any snow in South Africa but DC gets plenty – especially this year. 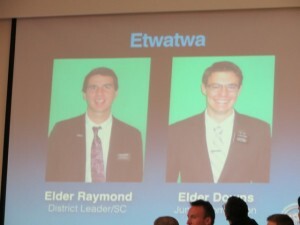 The picture came from one of their sons who works in DC. 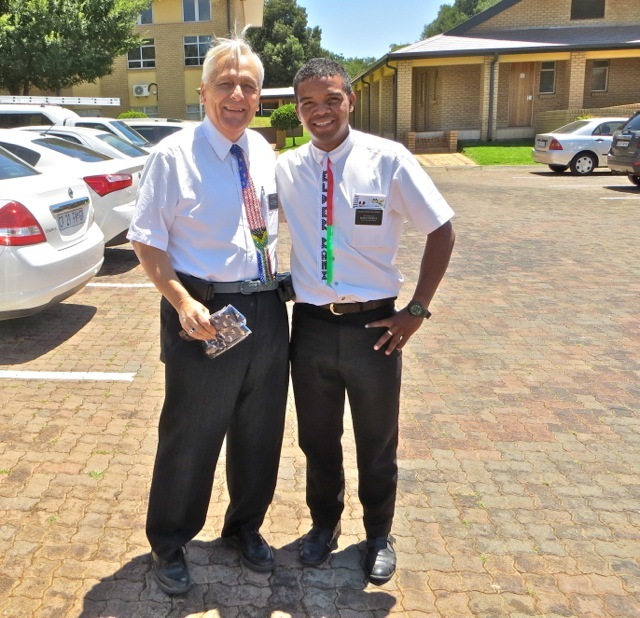 This entry was posted in Johannesburg Mission - Back To Africa on February 25, 2015 by Bill. This entry was posted in Johannesburg Mission - Back To Africa on February 24, 2015 by Bill. We dropped in at the office to see if the window screen had been re-welded so people could not easily get in. 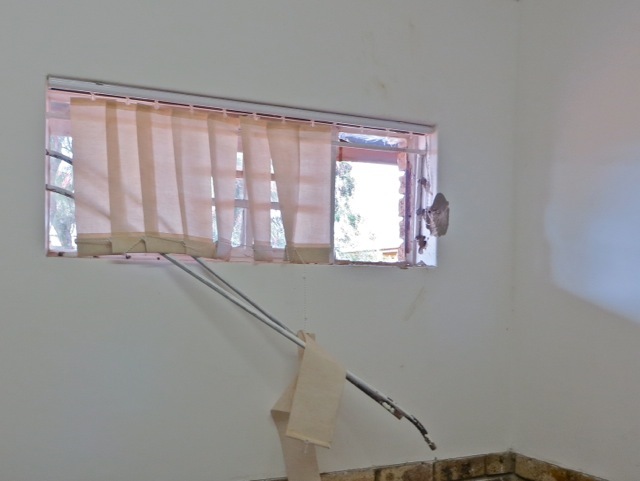 This would be a temporary fix until physical facilities could get people here to do a more permanent and hopefully stronger repairs. 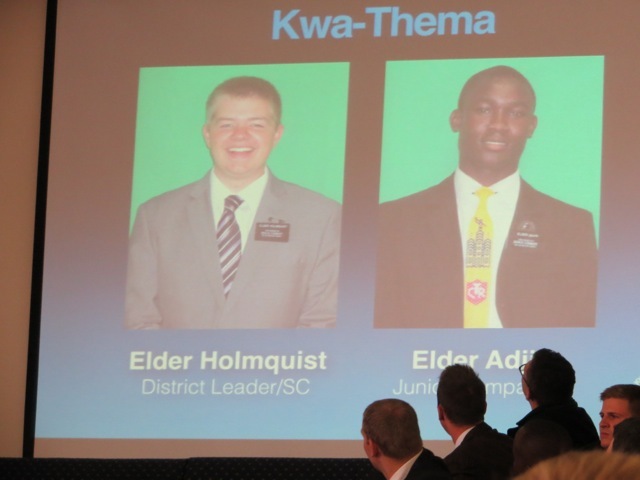 We then took the opportunity to stay for the YSA FHE where president Kwaikwai taught the last 4 Articles of Faith. 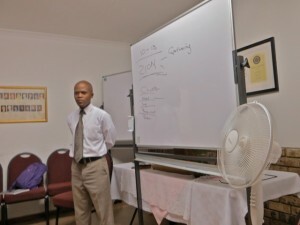 There was not a big turn out but those who were there received good instructions and lots to think about. 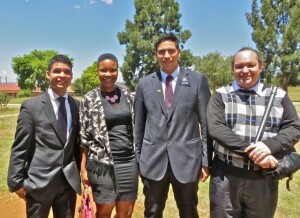 It was good to see brother and sister Williams along with the YSA representatives are doing an excellent job providing a meaningful FHE. 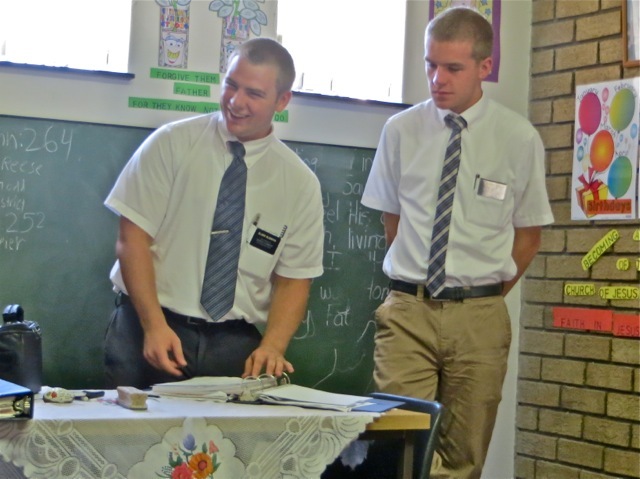 This entry was posted in Johannesburg Mission - Back To Africa on February 23, 2015 by Bill. This entry was posted in Johannesburg Mission - Back To Africa, Mission - MTC and Bishops Storehouse on February 23, 2015 by Bill. 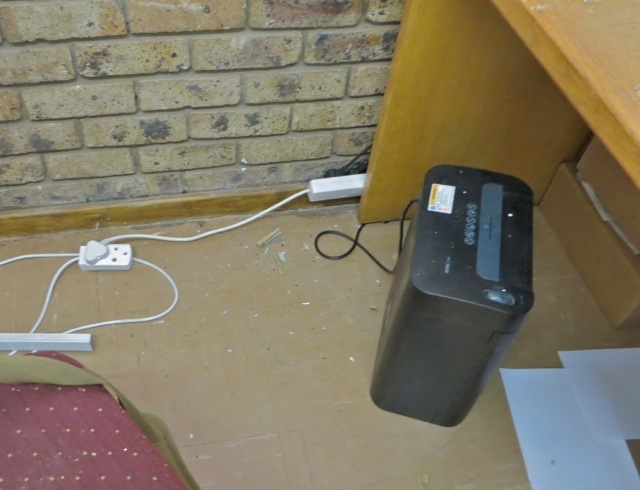 23 February 2015 – We Lose a Computer – Again! 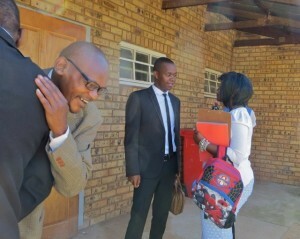 I received a call from the principal of the school where we rent some of the rooms for our branch offices and storage. 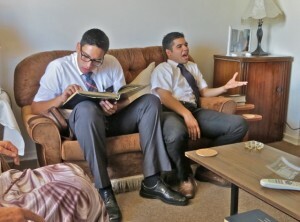 He told me that we had a break in. When I arrived I found that someone had managed to pry the metal screen off the front of the window, break the glass, bend the security bars out of the concrete and steal the computer, monitor, keyboard and mouse. They left behind a keyboard, a projector and a DVD player and did no damage to the rest of the offices and classrooms. This break in is almost identical to the one that occurred in March 2014 soon after we arrived and I became branch president. 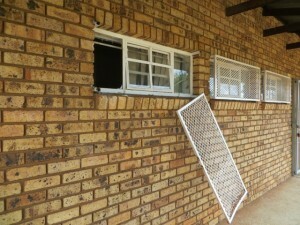 The same window was attacked and basically they took the same things. They do not take the printer because it will not fit through the window which is about a foot square. 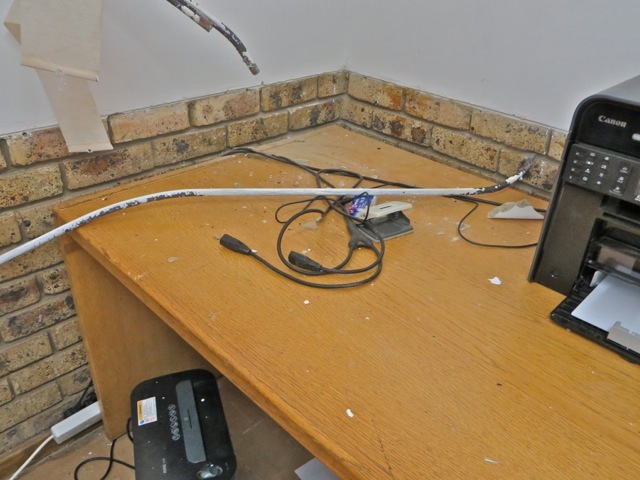 We are hoping that since the thieves have decided that we are a good place to break in to that we will now get an alarm system for this part of the offices. 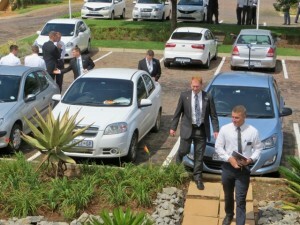 The police were called and the first set of officers arrived to make out a report about what happened. A couple of hours later some detectives called and came in and looked over the damage but really did nothing else. 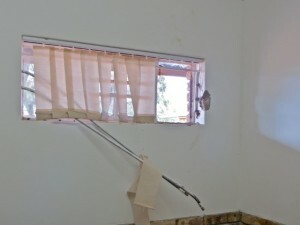 Our friend Syd from Physical Facilities came down from Joburg to see what happened and will do some emergency repairs so that the rooms will be at least somewhat secure until a permanent repair can be made. He has been waiting for the fingerprint crew to arrive and as of 7 hours after the police had been notified, they still have not arrived. Once again the Potchefstroom branch was blessed with perfect weather for our meetings. Everyone is use to elder Pier taking pictures when the Saints gather. 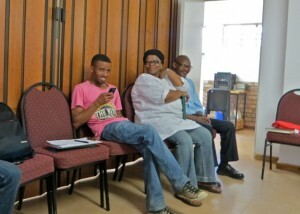 It is kind of a record of our Sundays here in Ikageng. 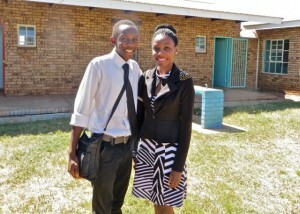 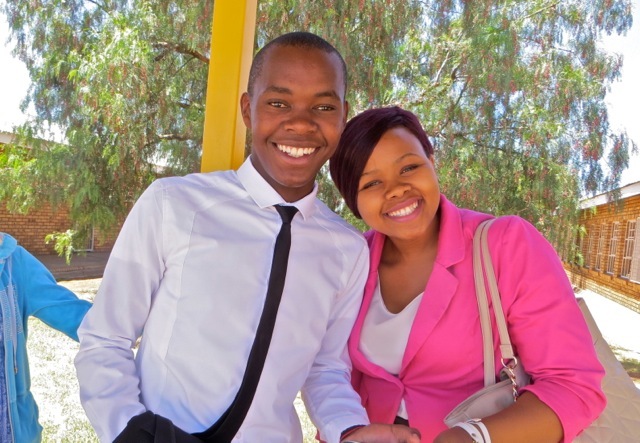 Brother Menzi is young man who is a fairly recent convert. 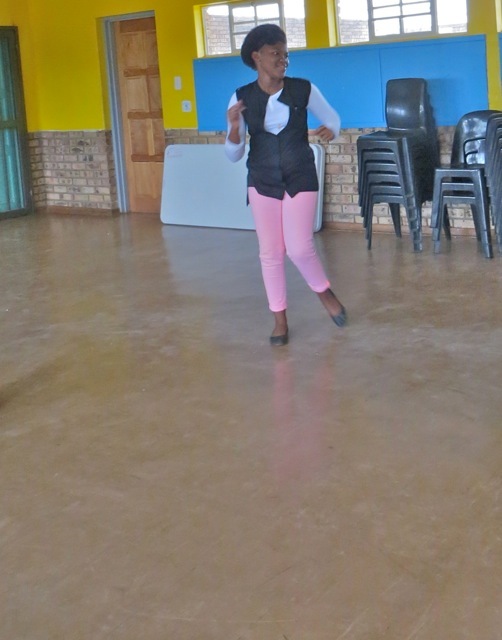 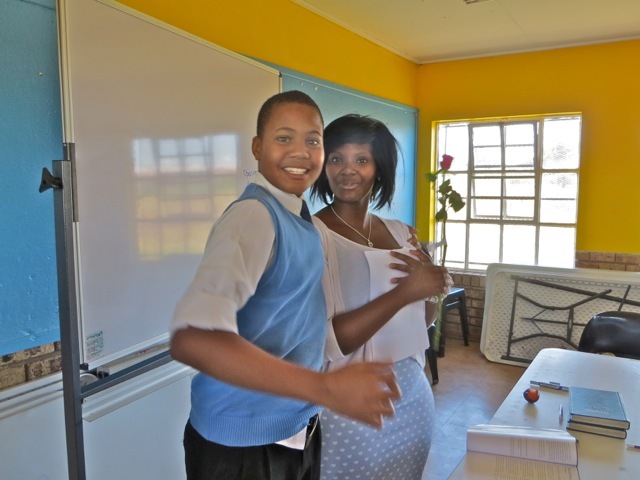 Sister Thato Kujane is an amazing young woman who gives some of the best prepared lessons and also fills in for other teachers on a moments notice. 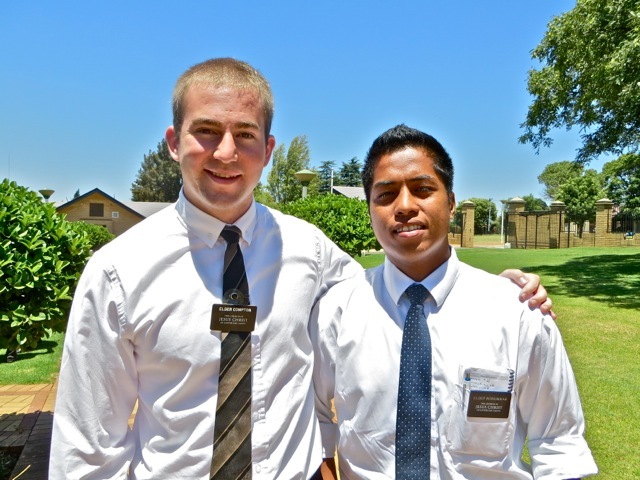 Brother Williams is really happy to greet an young man who returned this year to go to college. 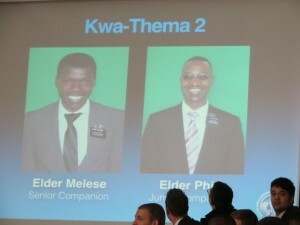 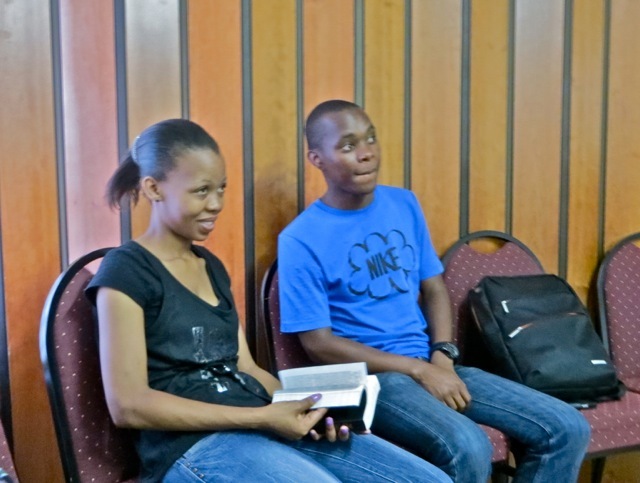 In the background brother Omphile – the 2nd counselor talks to sister Disney. 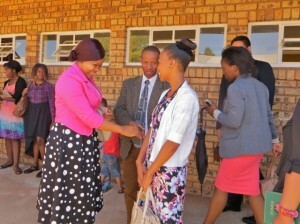 Sister Kea in pink talks to sister Ratema while brother Ncapayi – the branch elders quorum president – looks on. 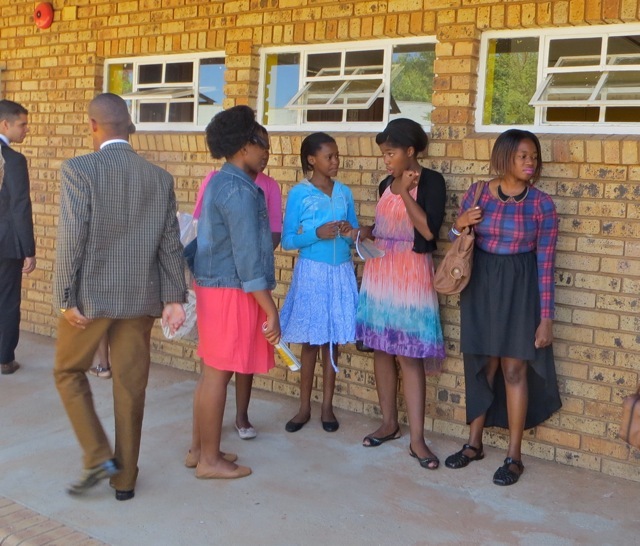 Most of the young women in the branch gather together between classes. 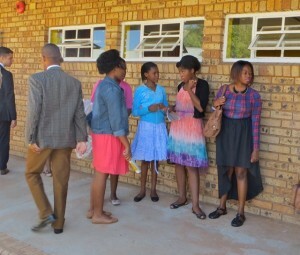 The William sisters, sister Lekebe, and sister Ntabiseng can be seen while sister Shavonne in pink is hidden behind one of the William sisters. 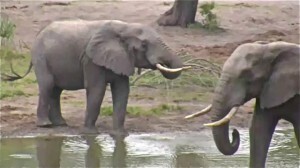 Sisters Kea and Ratema stuck a pose for their glamour shot. 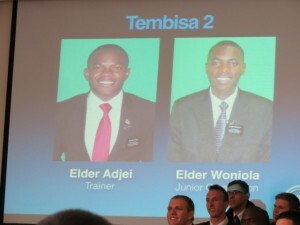 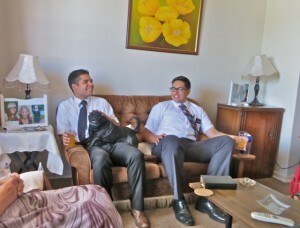 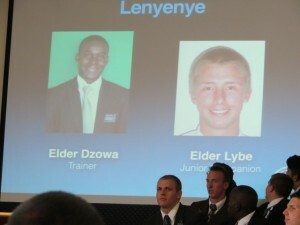 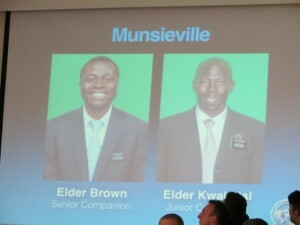 Brother Williams with brother Tenishe talk about old times. 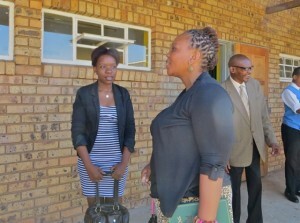 Sister Kujane in the foreground is the RS president. 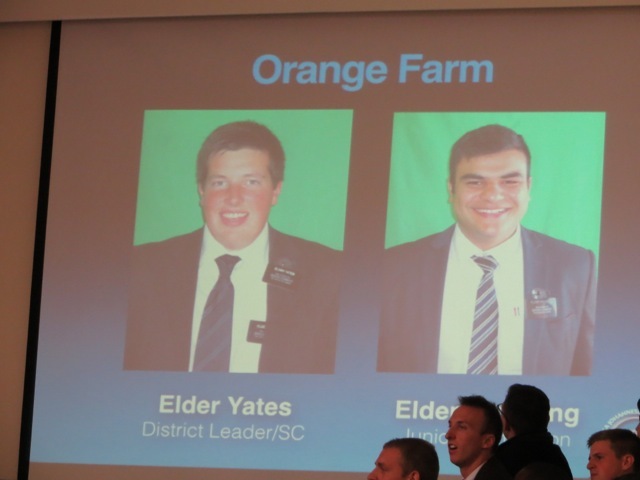 On March 21st the YM and YW of three branches are going to get together for a special dinner dance. 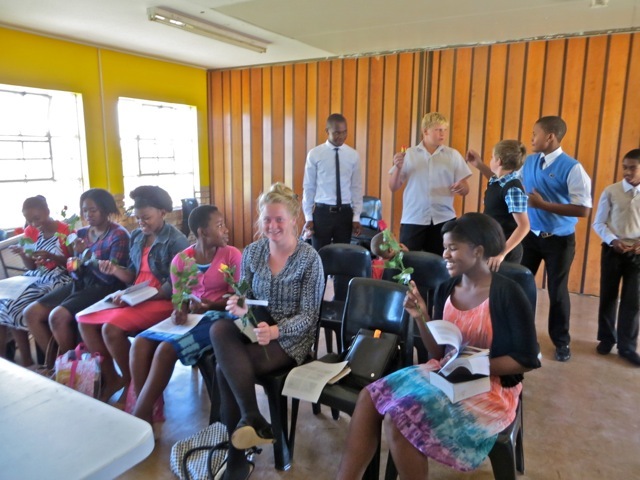 Today the YM officially invited the YW to the dance by giving them each a rose with a written invitation attached. 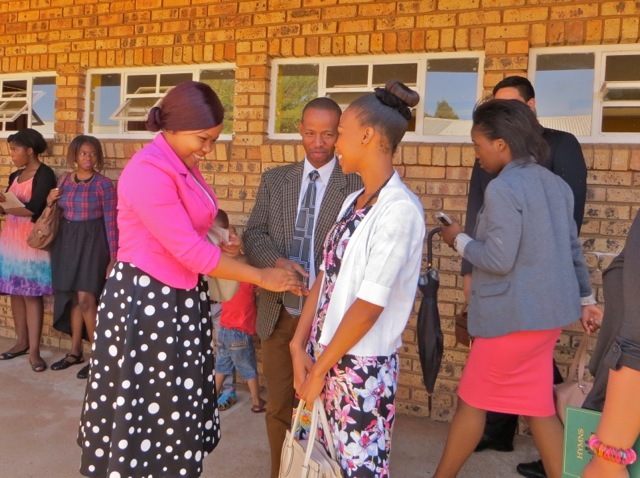 Papa Thulo was able to give his sister her rose. After the block I took this picture of Omphile and Kea who are a couple and you can see why. 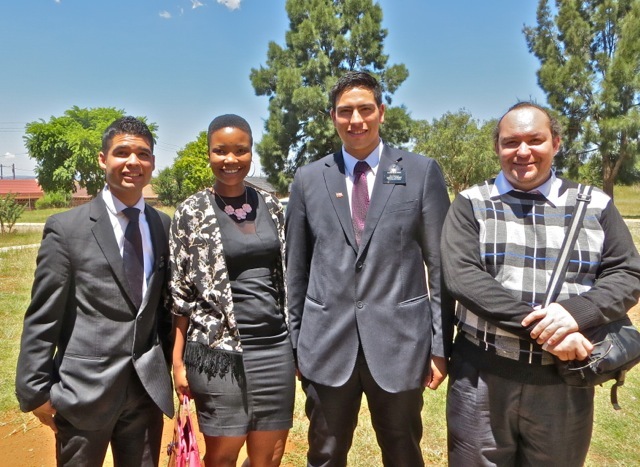 Then there is the picture of elder Liera, sister Renny, elder Alvial, and brother Louw who were about the last ones left besides us. 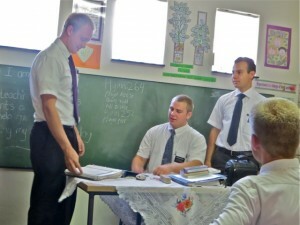 So there were lots of smile, a spiritual sacrament meeting, and well prepared lessons for Sunday School, PH, RS and other classes. 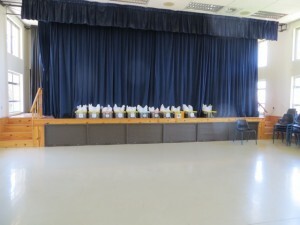 I did not get a picture of the primary but they could be clearly heard singing “Popcorn Popping on the Apricot Tree,” and other familiar Primary songs. As the 50th section of the D&C says all were edified! 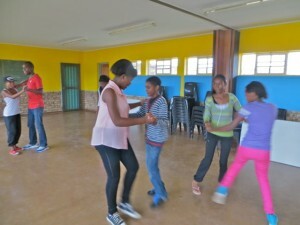 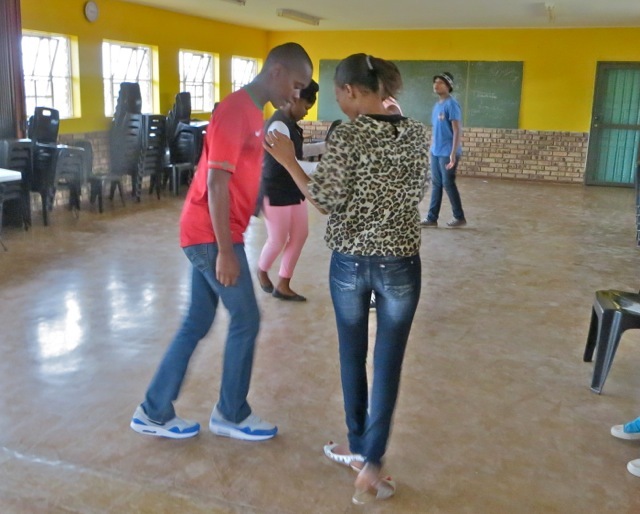 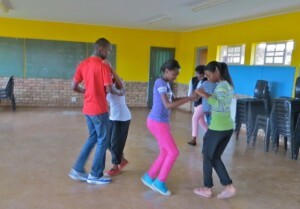 21February 2015 – The Youth Have Dance Practice! 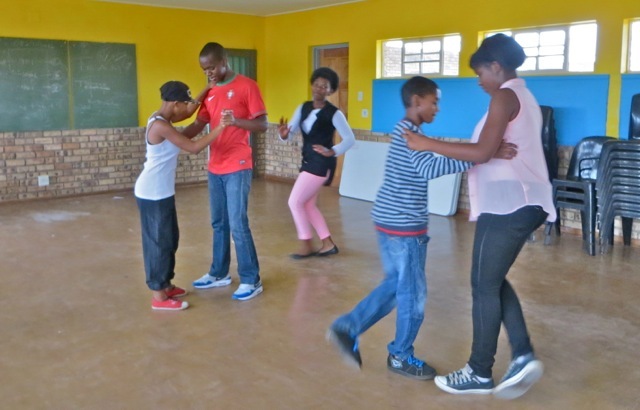 The second week of dance practice attracted a few more youth and brother Omphile personally taught those who were not present last week. You can see that sister Nasi Williams did not need a partner to practice. She just had to move to the music with a big smile on her face. Brother jacque Kruger dances with his taller partners sister Kayne Lekebe. 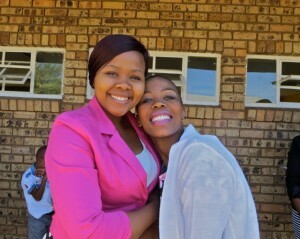 The other sister Williams in her bright pink pants dances with Jacque’s sister Shavonne. 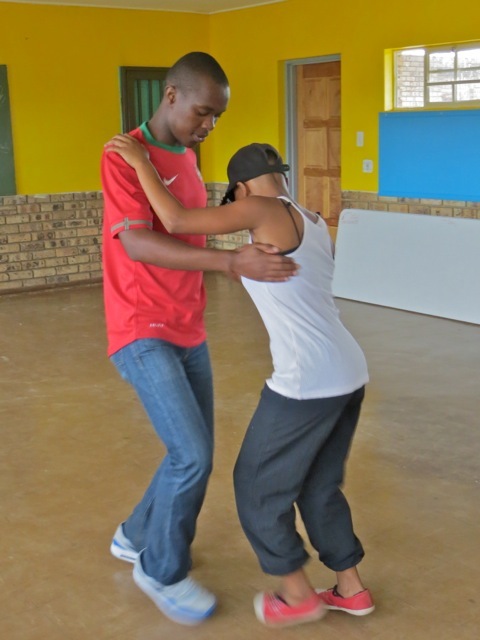 Towards the end of the practice sister Ratema joined in and she and brother Omphile tried some new steps. 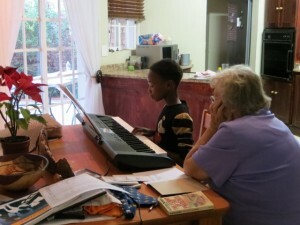 Earlier in the morning Mary taught piano to Lorato Kujane at our flat. 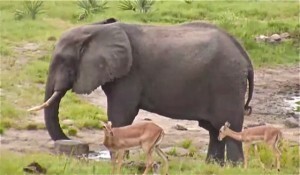 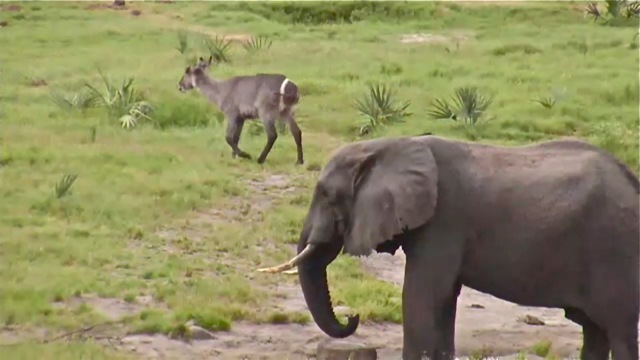 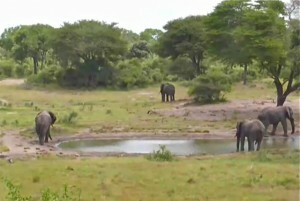 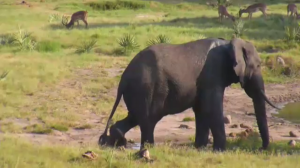 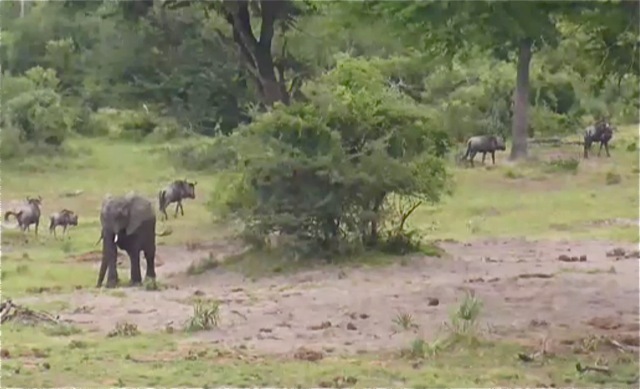 To round out the pictures I posted a shot from Tembe Elephant Park’s webcam with a good size elephant and impalas. 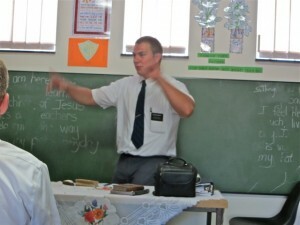 Today was elder Oldroyd conducted his first District Development Meeting and he did a great job. He was well prepared, moved things along, and gave a good lesson on personal prayer. 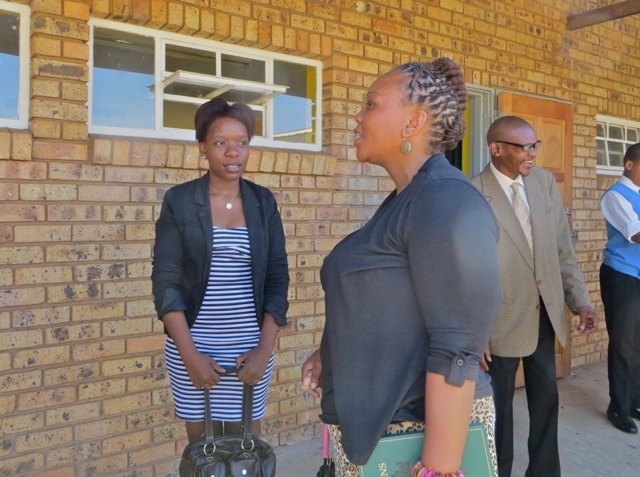 The Ikageng elders – Liera and Alvial were not present for much of the meeting because the Zone Leaders came down and held an unannounced flat inspection before the meeting. The meeting started with elder McAllister leading the music and everyone else keeping the beat as they continue to learn how to lead. Elder Todd seems to already knows how to lead. 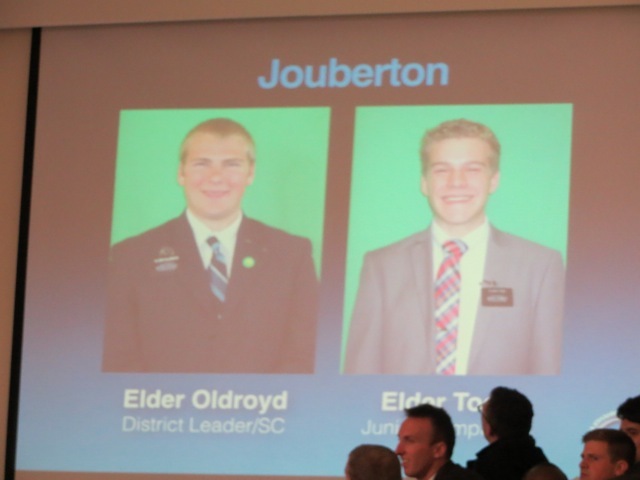 After the opening prayer elder Todd – who now serves with elder Oldroyd in Jouberton – led the quote “The Standard of Truth.” Then it is time for each area to give a report on some of those they are working with. 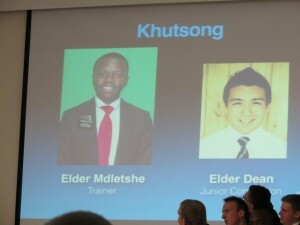 Elders McAllister and Di Ruscio reported on serving in Klerksdorp. 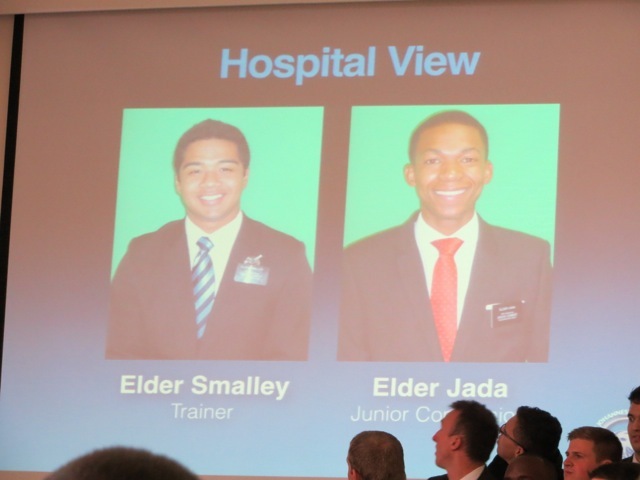 While they were giving there report elder Oldroyd looked to see how well their area book reflected what they were reporting. Area books are very important because if the area gets whitewashed it is the only way the new elders knows what is going on and who has been taught what. Elders Oldroyd and Todd then reported on their area. 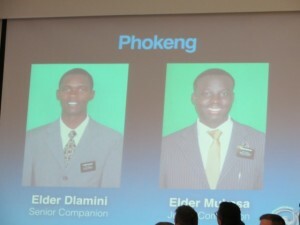 Both of the areas have a number of baptisms scheduled for the coming weeks. 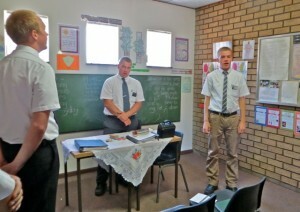 The ZLs and the Ikageng elders arrived in time to take part in the lesson but I did not take any pictures. 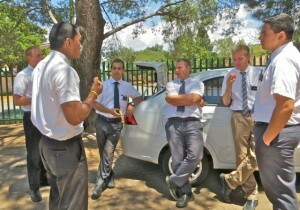 After the meeting the elders got to eat some cold apples and chocolate rusks. 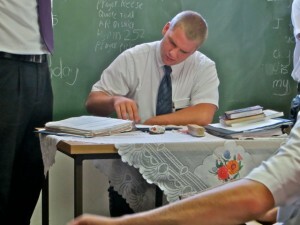 I like to bring rusks to the meeting because many of the elders have never eaten this South African snack. 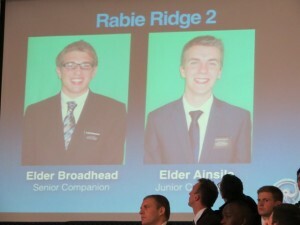 I got this good shot of elders Oldroyd and Todd. 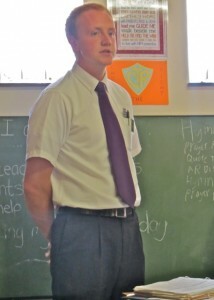 Elder Todd has been in the mission since September 2014. 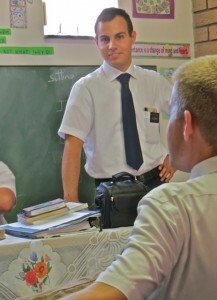 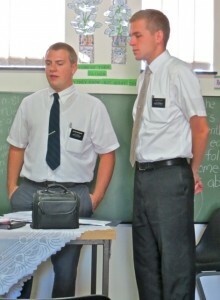 After his 3 months of being trained he had the opportunity to train a new missionary. It is unusual that an almost green missionary does training so the APs and president Dunn must think highly of him. 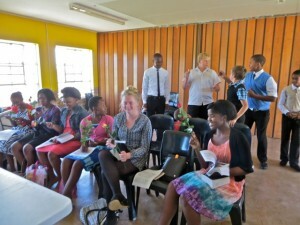 I managed to get all those present at the DDM in these two pictures. However I only got elder Liera’s back. From left to right in the two pictures. Elders McAllister, Elder T, DiRuscio, Oldroyd, Todd, Alvial, Dummer, Liera, Reese, sisters Pier and Dummer. 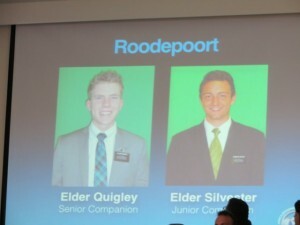 Hey where is elder Pier? 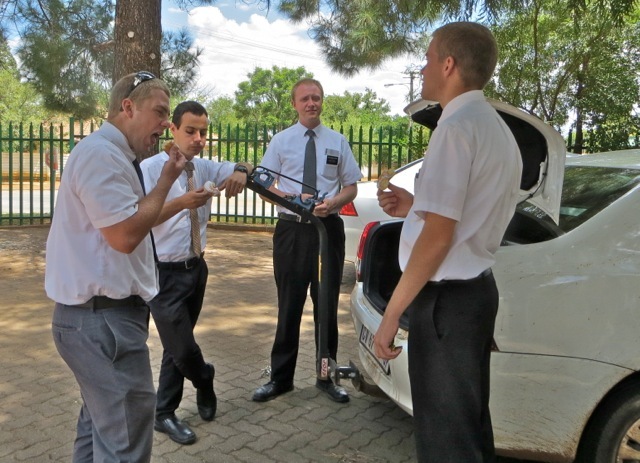 This entry was posted in Johannesburg Mission - Back To Africa on February 20, 2015 by Bill. For at least an hour before and an hour after transfer meeting the parking lot is full of elders and others talking, hugging, and just enjoying each other’s company. There is a special energy and spirit in the air. Former companions catch up with what has been going on since they were transferred. After the meeting lots of luggage and other things are transferred from one car to another for the trip to their new areas. 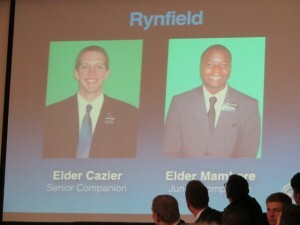 New district and zone leaders get some training for their new callings. 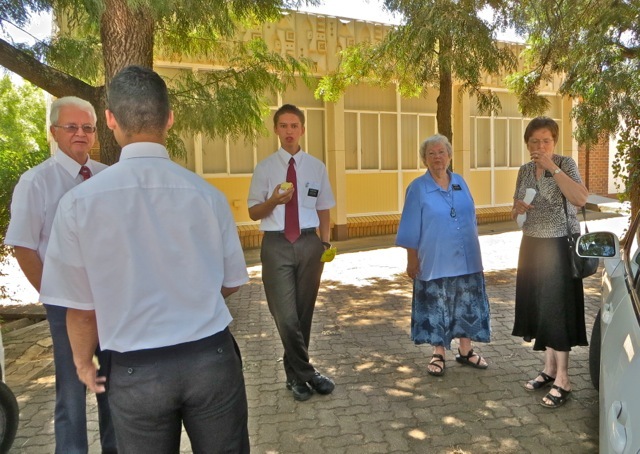 In the picture on the left, elder and sister Hansen talk to some missionaries while two their daughters who are here for a visit watch and listen. 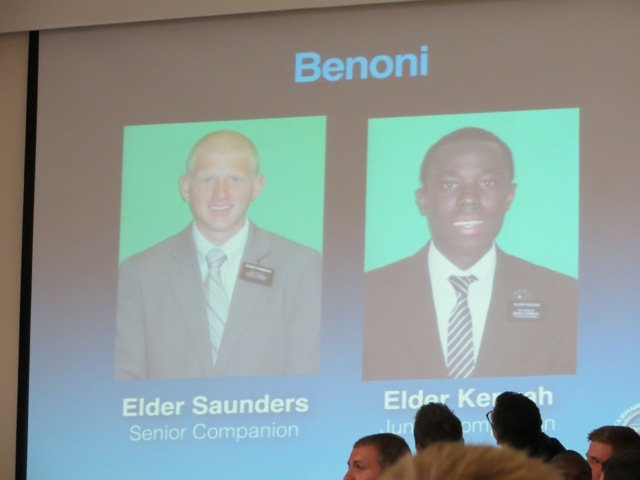 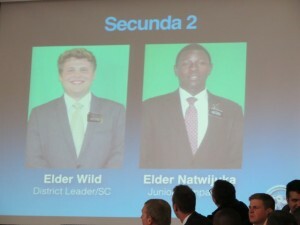 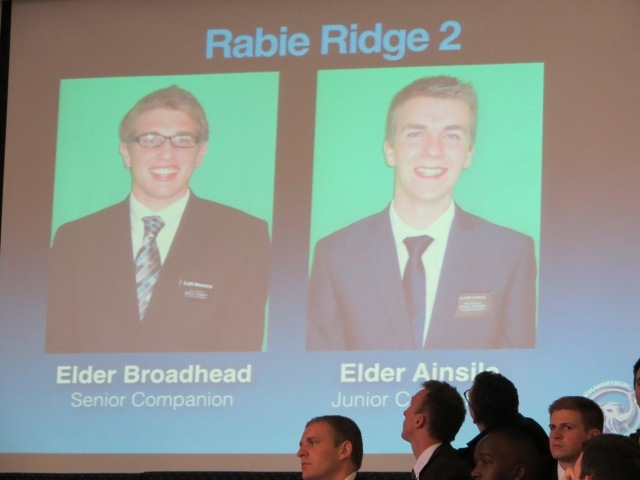 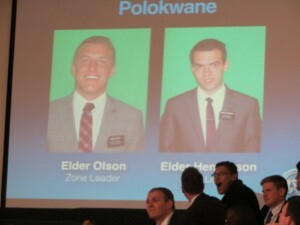 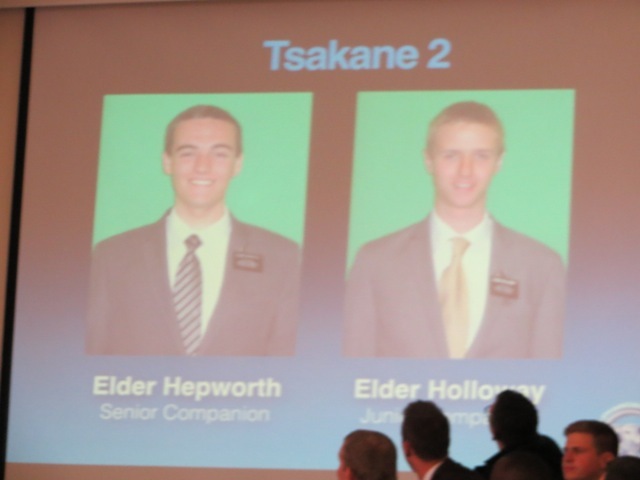 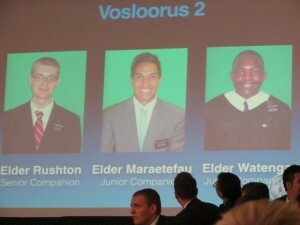 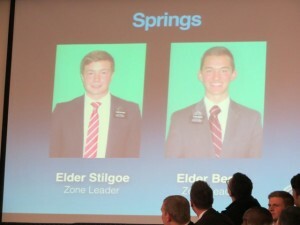 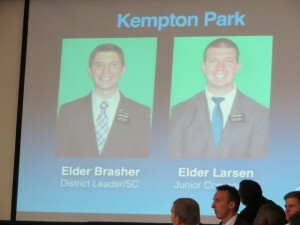 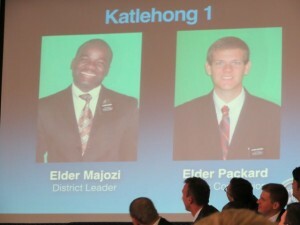 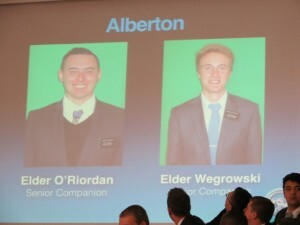 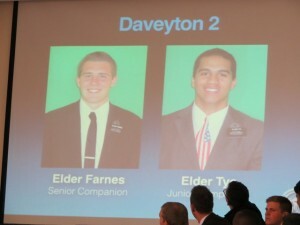 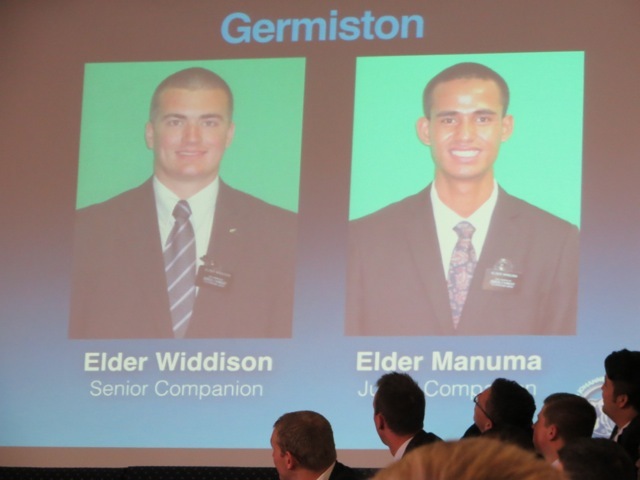 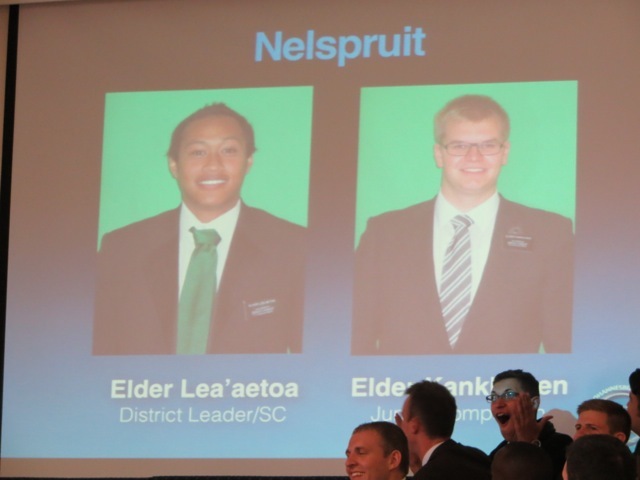 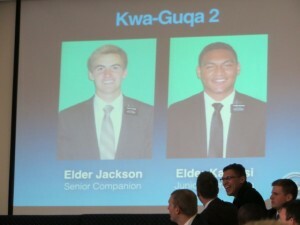 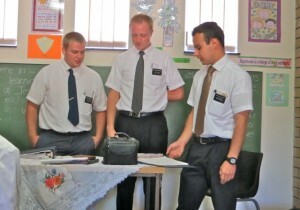 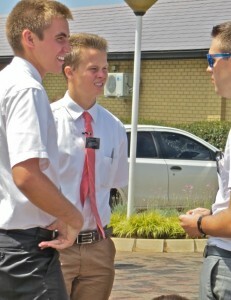 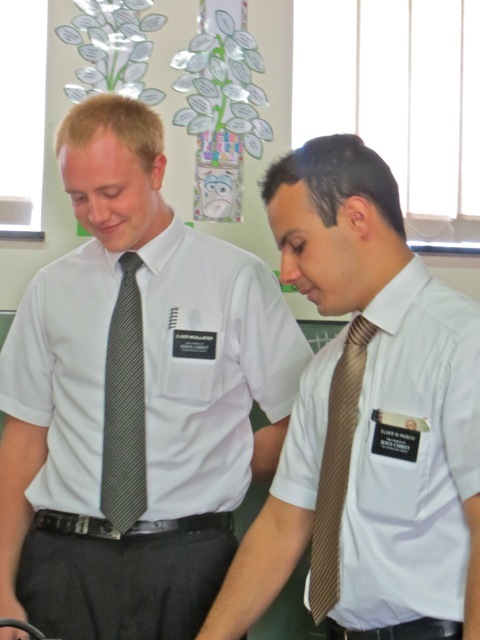 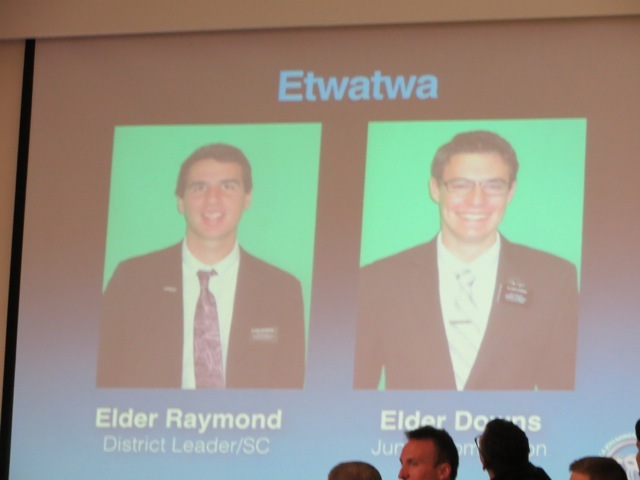 On he left is the red headed elder Johnson – he is always easy to pick out and others. 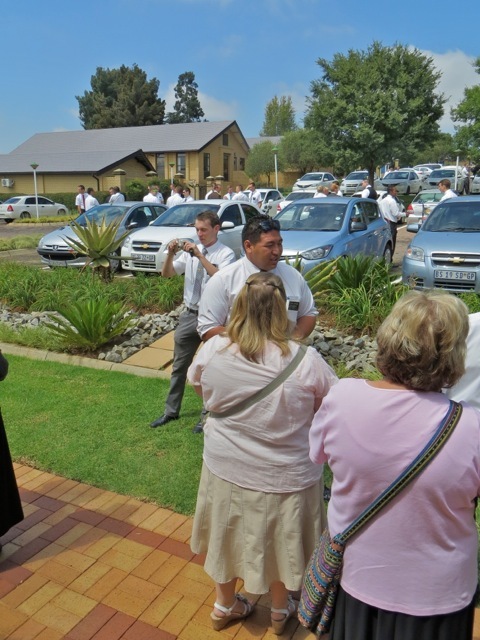 A closer look at the group in the background of the last picture show our good friend elder Taylor (in the suit) talking to elder Whitesides (blue tie). Elder Stephens – a former AP – appears to be writing on his thumb. The Hansens took the opportunity to get pictures taken with some of the elders. 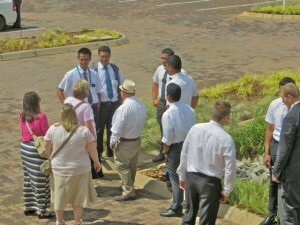 They are standing on the steps that lead up to the mission office where they served for most of their mission. 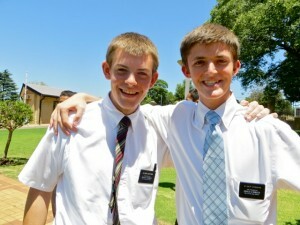 I believe they go home at the end of March. 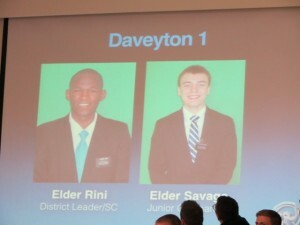 Elder Segil wore his name tie. 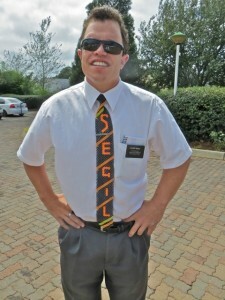 If you remember the last transfer I kidded him about not knowing who he was if he did not wear this tie. 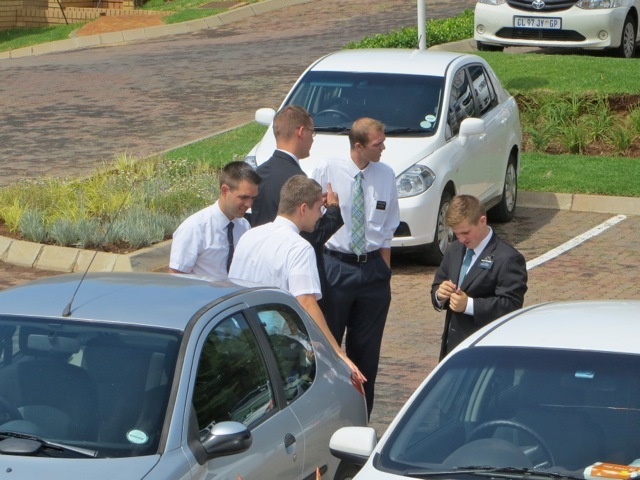 Notice all the clusters of elders behind the cars in the parking lot before the meeting. 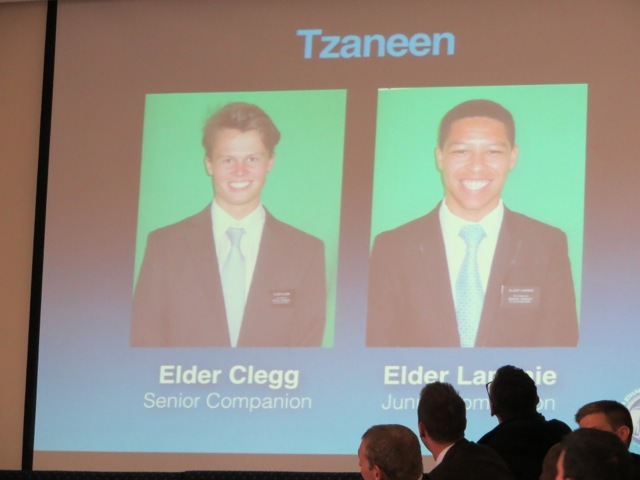 I only took one picture of elder Clegg which is unusual since I have a good e-mail relationship with his mother. 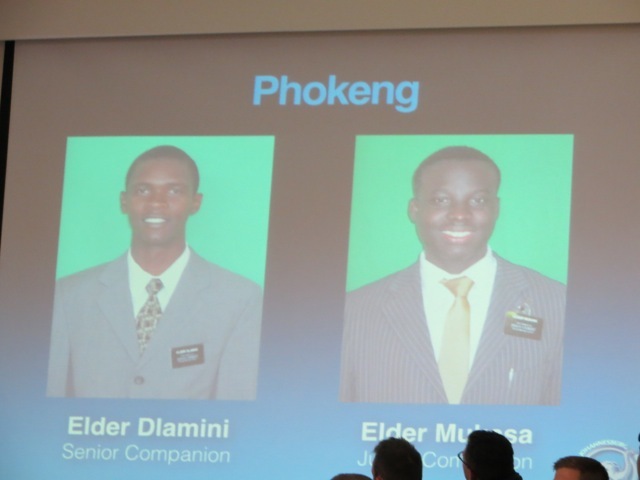 I try to take more pictures of elders who parents follow our blog or FaceBook accounts and let me know that their missionary is here in South Africa. 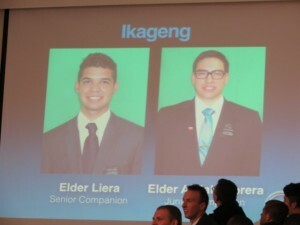 After the meeting the elders go into the cultural hall where there are packages of materials, copies of the Liahona, mail, and the mission new letter ‘Cumorah Crest’ for each area. 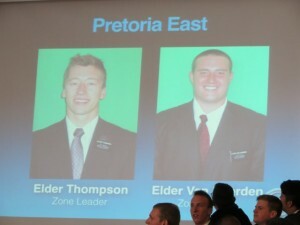 If a companionship is not here and no one picks up their package, the Zone Leaders will take them. 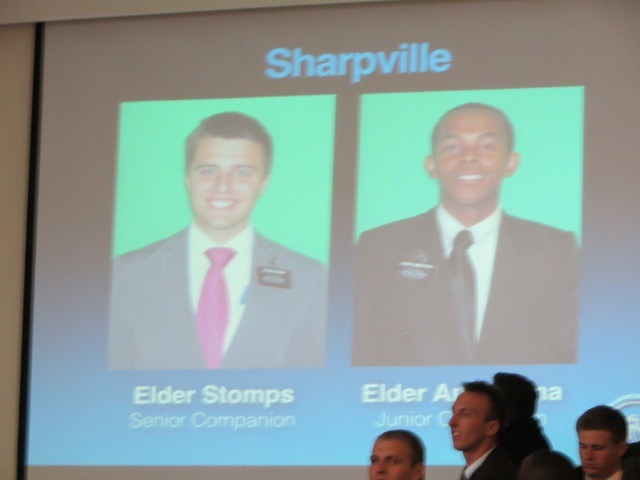 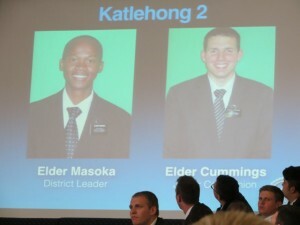 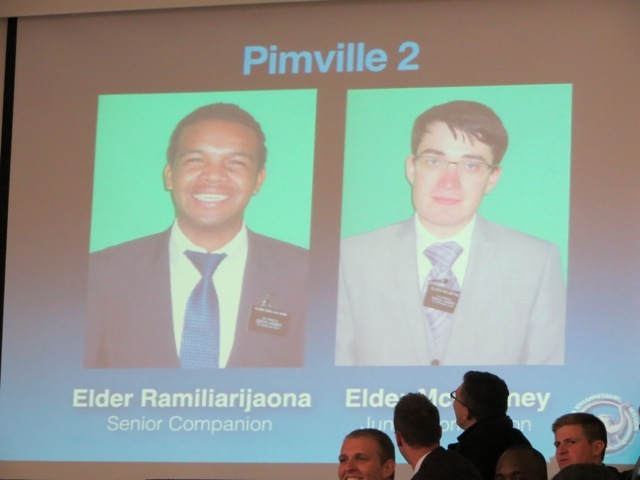 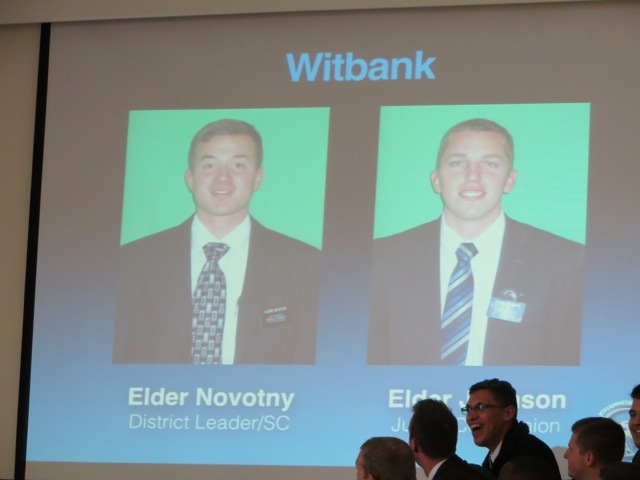 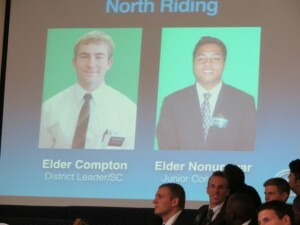 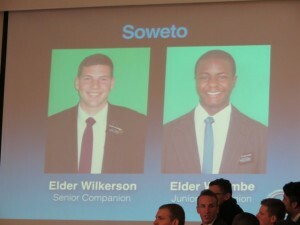 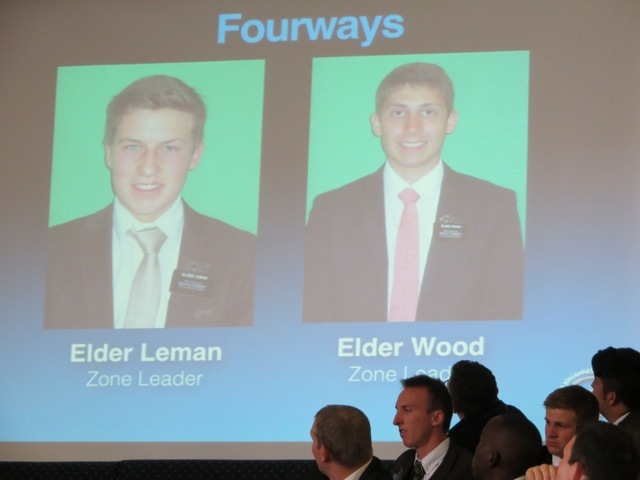 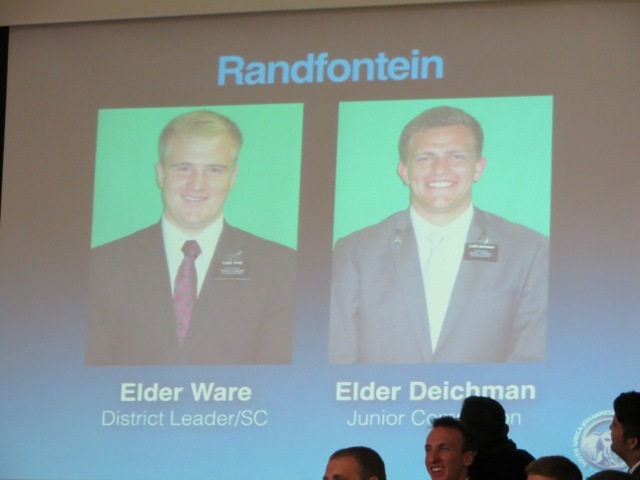 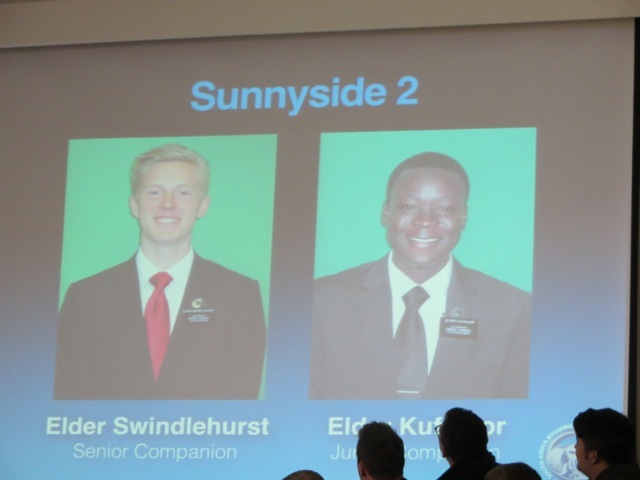 Elder Compton’s – he was the District Leader for the Ikageng District when we arrived – new companion elder Nonumwar – they will serve in the North Riding area. 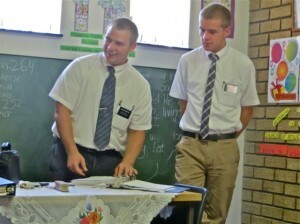 The piano playing elder Dutson with our good friend elder Graham. Sister Dunn tries to talk to as many of the missionaries as she can. 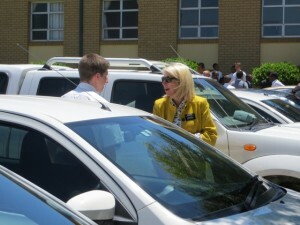 She really is the mission mom! 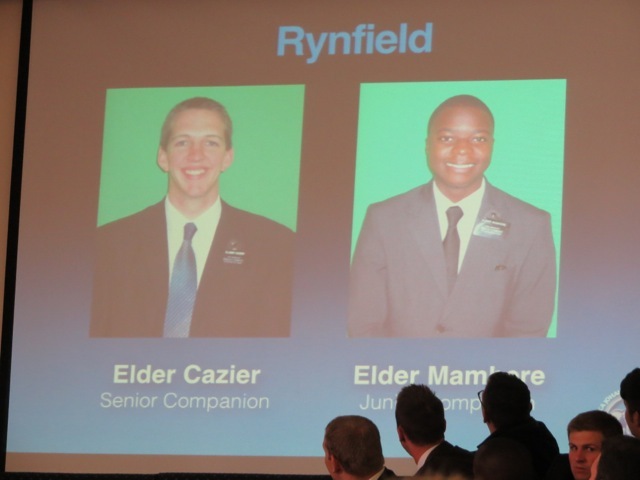 A last picture with elder Rami as he was transferred to the Pimville area where he will serve as senior companion to elder McCartney. 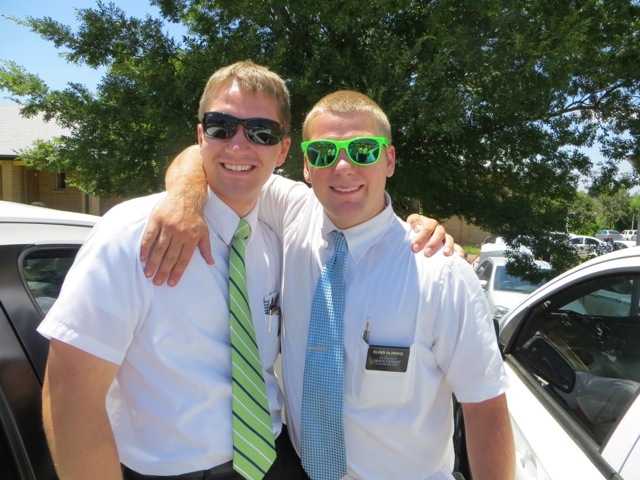 Elder Oldroyd on the right tried on a friend’s pair of bright green glasses – they do not match his tie as well as they did his friend. 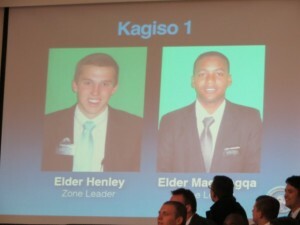 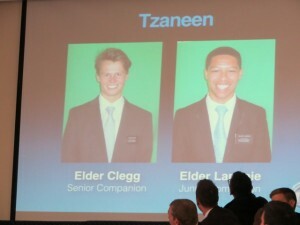 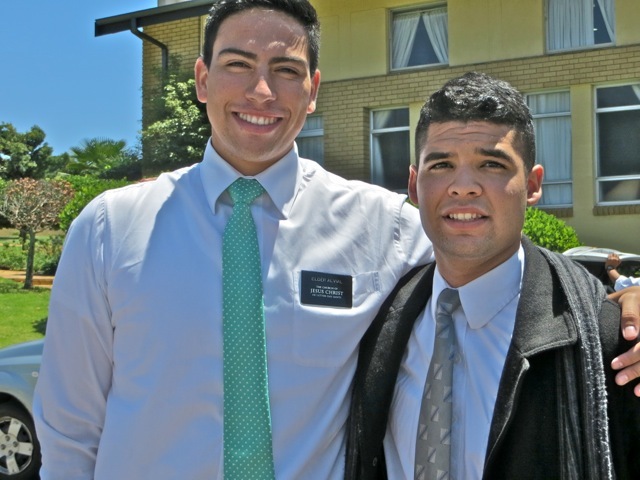 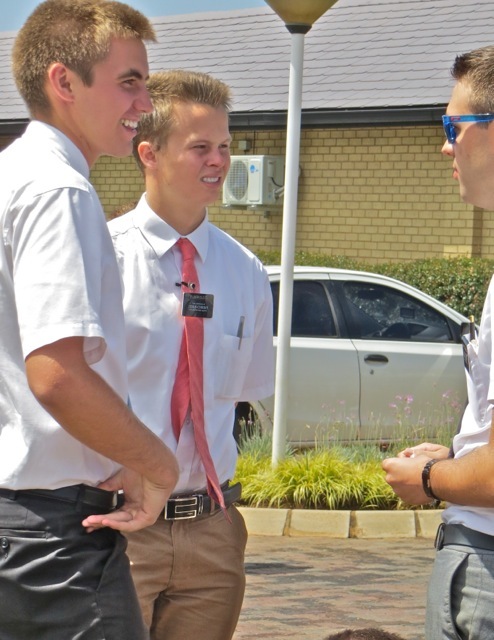 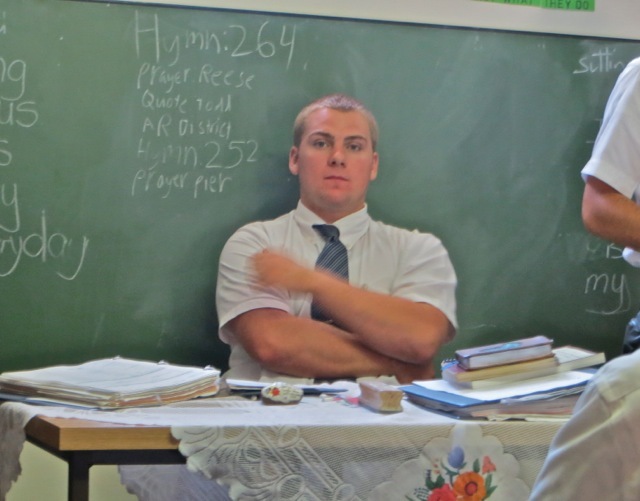 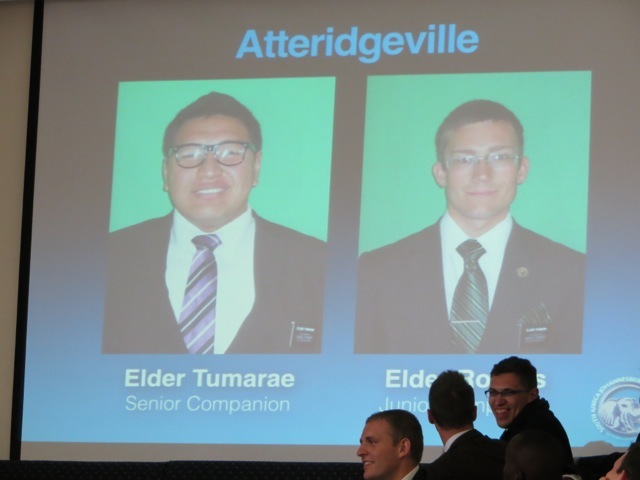 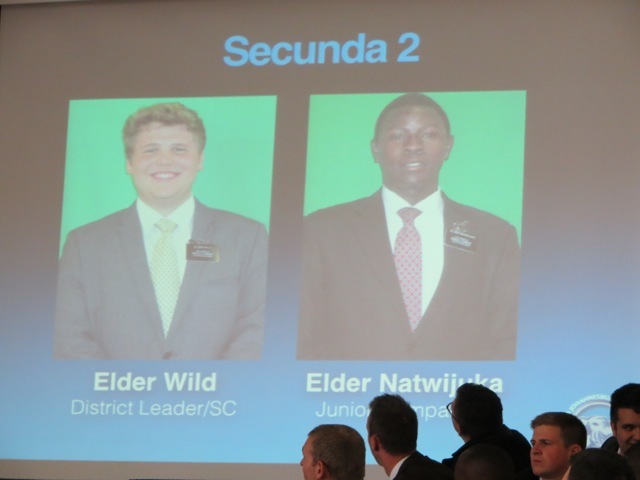 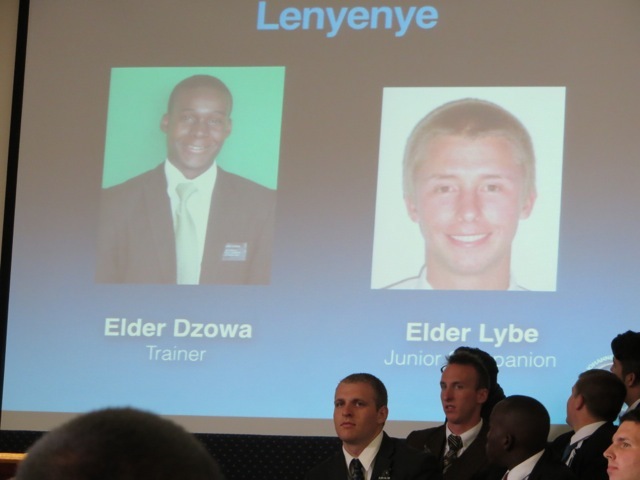 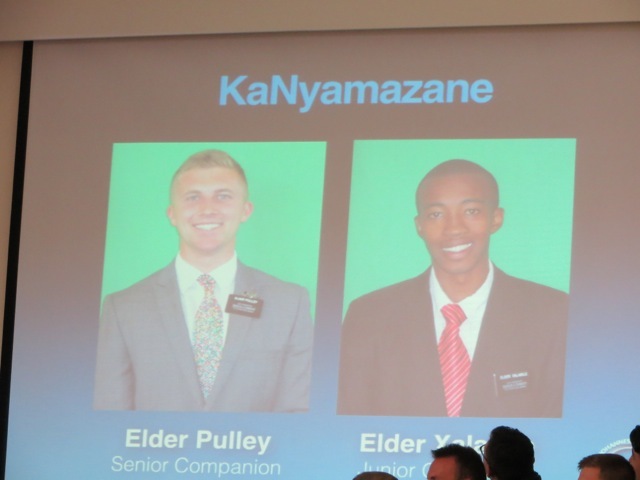 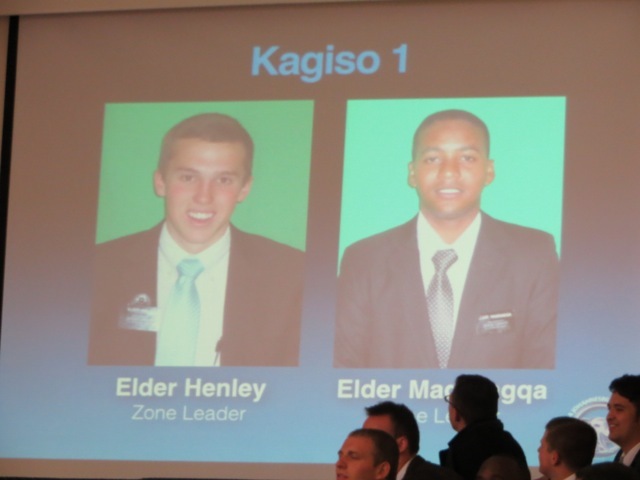 With elder Taylor heading for home elder Liera has a new companion here in the Ikageng area – elder Alvial is from Chile so he and elder Liera can speak Spanish. 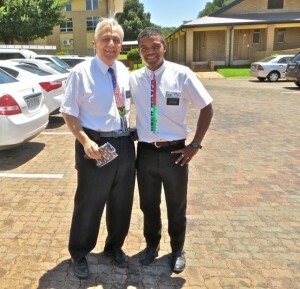 This entry was posted in Johannesburg Mission - Back To Africa on February 18, 2015 by Bill.